I'm not going to lie. I've waited months for this day. After the brutal winter we had, it was hard not to anxiously anticipate the unofficial start of summer. I am armed and ready with plenty of summer essentials. Are you? First off, summer skin care is a must. I spend a lot of time at the beach, but not a lot of time in the sun. Sunblock and an umbrella are a girl's best friend in the summer. It offers superb protection for only $13/bottle. Available in mass retailers and drug store nationwide. After spending all that time smothered in sunblock and under an umbrella, I need something to give me some color. I love Jergens Natural Glow Express moisturizer and self-tanner. Within 3 days, you'll get a full shade of color. 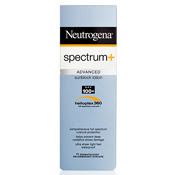 For $8/bottle, it's a lot safer and less expensive than a tanning salon. And we can't discuss skincare without including a hat. 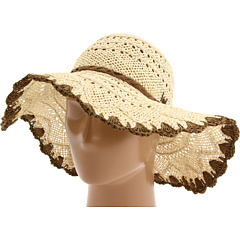 I love this hat from Volcom. I don't currently own it, but for $31, it's a summer must-have. Not to self: must buy. OK, let's talk shoes. Do you have all day? A basic flip-flop is a summer staple. I bought these just moments ago. They are basic yet chic. They were a bit of a splurge at $45/pair, but a good, sturdy pair of flip flops is a must. Tory Burch Foundation flip flops are available at toryburch.com. The wedge. In case you haven't noticed, wedges are blazing hot! I love wedges! I'm only 5'2", so a wedge gives me height. Gotta love that! I picked this pair up today at the half-yearly sale at Nordstrom. This is the BP Stella Sandal, and the pair costs $32.90. Serious love here. OK, my final staple for summer is a pair of sunglasses. There are several schools of thought on sunglasses. I've asked around, and it seems as if there are two groups of sunglasses wearers and buyers. There are those who splurge on a fantastic pair of sunglasses, and there are those who take the cheap way out and buy a pair for next to nothing. I belong to that latter group. For some reason I have issues spending more than $20 for a pair of sunglasses. I've never had a fabulous pair of sunglasses. I have the absolute worst luck with sunglasses. And so, I've never invested a lot of money in them. Either I or the kids sit or step on them. I drop them and they become scratched. It's not worth it. So, in light of my diatribe above, I'm not going to show any pics of my sunglasses. But I will say that I've bought aviator-type sunglasses at Wal-Mart for $5, and I absolutely love them. I've bought $15 Cover Girl sunglasses at my local grocery store, and I love them. What I've saved on sunglasses, I have spent on a case. 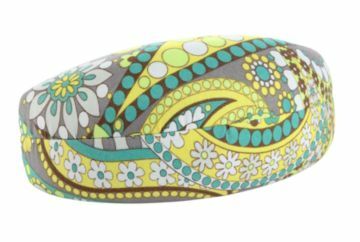 I recently splurged on a Vera Bradley sunglasses case for $22. Yes, my case costs more than I've ever spent on a pair of sunglasses!! I bought the large case in Lemon Parfait. I love it! So worth the splurge. What are your must-haves for summer? Please share.